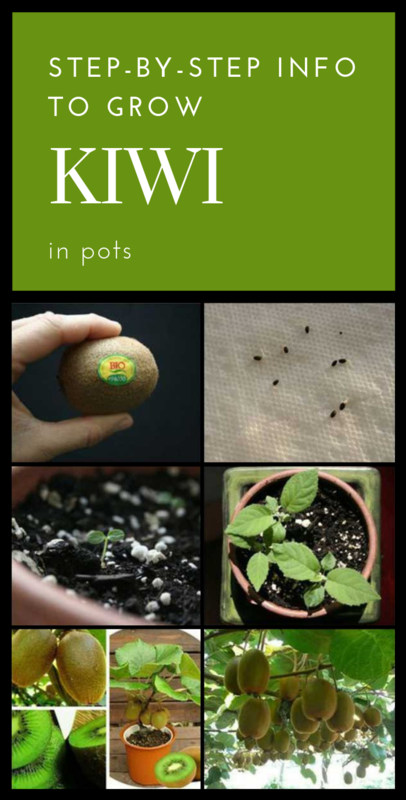 Now is the best time to grow kiwi in pots or in the garden! The optimal period to grow kiwi is from March to May. Buy a ripe fruit, which is healthy, soft and homogeneous. Wash the fruit and cut it into a few pieces. Carefully separate the core and put it in a glass of hot water. Mix well and leave it to cool alongside with the water. Wash the mixture a few times, until all seeds remain in the glass of water, floating to the surface. Place the seeds on a napkin and wait for 2-4 hours to dry. Wrap them in cotton or a piece of cloth and put it in a pot of hot water. Cover the pot with plastic foil and put it in a sunny place. Overnight you should remove the plastic foil, and in the morning fill it again with water. After 7-10 days the seeds will sprout. Place a little clay or gravel for drainage on the bottom of a pot. It would be good if you use soil for exotic plants. Keep it in Bain Marie for 2 hours, and then make small dips of 5-10 mm and put 2-3 seeds in each one. Cover them with a little soil, pour a little water at room temperature and cover the pot with plastic foil, placing it in a sunny and warm place. After 3-6 days the shoots will emerge. Already at this stage you can remove the poorly developed shoots. Water the soil gradually using only spring water. During winter, kiwi growth will slow down, that’s why plants can be watered 2-3 times a month. During vegetation, in spring and summer, kiwi needs more moisture, so it should be watered twice a week. And when the temperatures are high, it’s recommended to spray the plants. Don’t forget to cut the sprouts in the pots so they can grow naturally. In their first life period they can easily be ripped, but later the stem must be cut, because the root system grows pretty fast and you may damage the plants around you. When the seedling reaches 10-12 cm in height, you can move it into separate pots so it can’t grow stronger. Under beneficial conditions kiwi will give the first harvest after 3 or 4 years since sowing.